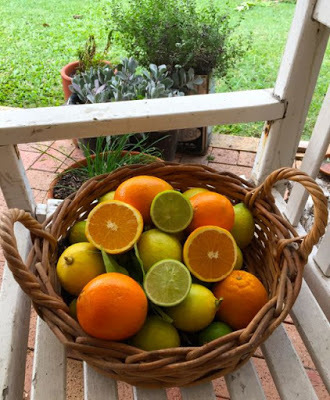 Soon the citrus harvest will be over with just a few fruit left hanging on the trees SO……. it’s time to get busy – that’s if you want a bumper crop next year. Time to sharpen the loppers, buy some trace elements, bales of mulch and get out there. 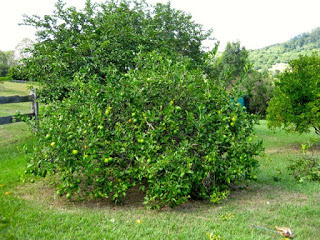 It is time to PRUNE, FEED and MULCH those hungry citrus trees – and it doesn’t matter whether they are in pots or in the ground – this advice applies to ALL CITRUS. I recently went to help a friend of mine prune her old, but prolific, citrus trees and she reckons we are in for a wet winter so it’s time to get those outdoor jobs while we can. 1. Branches hanging on the ground. 2. Crossing branches in the middle which rub together and then can be a site for pest and disease attack. 3.Tree getting too tall to be able to reach fruit. 4. Dry, cracked and bare ground under the tree. 1. Taking out some the large inner branches, as well as lifting the skirt off the ground, allows for better airflow through your citrus and helps to deter diseases. 2. My retired farming friend, who used to be a commercial citrus grower, says not to be too timid when pruning and was just about to take to this tree with a pair of shears “just to give it a final haircut”. 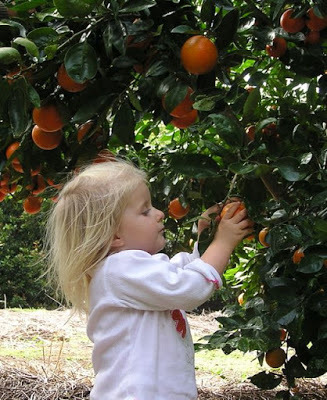 Her tip – don’t let your trees get too tall so that you can’t reach the fruit. FACT: Pruning actually encourages more growth and flowering – and that means more fruit.TOP TIP: Gardeners are often reluctant to prune while there is still some fruit on the tree, immature or otherwise – but you have to do it sometime! If you leave it until late in the winter you will be cutting off the developing flowering buds. Here are a couple of ways I use up that excess fruit. 1. Juice the fruit and make frozen ice cubes which you can store in the freezer until you need them. *Cut the washed fruit into quarters and stuff into sterilised jars – salt the bottom first. *With every layer of fruit add some salt. *Top up with squeezed fresh juice. *Weight down with a stone that you have cleaned with boiling water so that all the fruit is under the liquid. *100g salt per 500ml jar. * I add bay leaves to the lemons – you can add cloves and cinnamon. HOW TO USE: Preserved Limes – with fish and seafood. 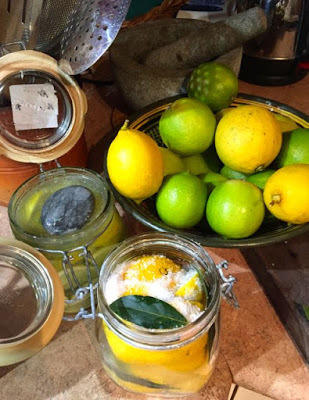 Lemons – Couscous, Middle Eastern dishes, tagines. Try this delicious lamb tagine dish – it needs 2 preserved lemons. 1. 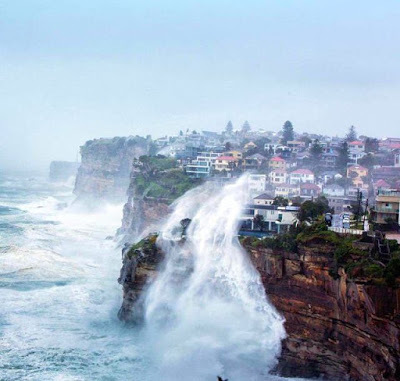 The whole of the east coast of Australia has just experienced a terrific storm with some folk on the North Coast, where I live, getting over 400mm in 24 hours (annual average 1,500mm) which means, for us gardeners, that many of the nutrients in the soil get washed away (along with the assortment of shoes from the flooded front porch!). 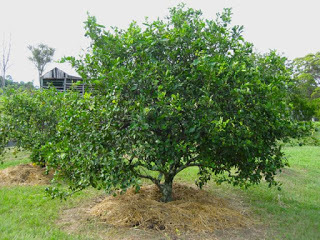 SO – with the portent of a wet winter, it’s time to care for your citrus trees – AND the best way to do that is by caring for the soil – that means FEEDING it and not leaving the soil bare, and MULCHING. 2. Note the tree in the top photo after we had finished. No more bare earth under under the trees. Each tree has been mulched out to the drip line – in this case with spent straw from a horse stable, but you can use anything; wood chips, composted grass clippings, spent sugar cane, lucerne – just about whatever you can lay your hands on. 3. An organic, pelleted, slow-release fertiliser (macronutrients) is the way to go together with a dose of trace elements (micronutrients). 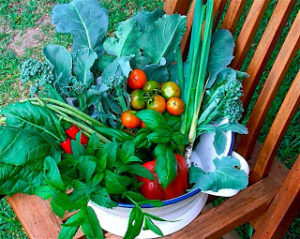 TOP TIP: Grow your own mulch! Plants some clumps of COMFREY and LEMON GRASS around your orchard – these can be slashed regularly and used as a green mulch. WHY – COMFREY has a long tap root and mines up minerals from deep in the soil, it also has a low carbon to nitrogen ratio so can be used fresh – unlike most green material – it won’t rob the soil of nitrogen as it breaks down. LEMON GRASS has essential oils that act as a passive pest control when the fresh leaves are used as mulch – for its size it also produces a lot of leaves. Making our patch more like a living organism and less like an artificial, unsustainable experiment just makes common sense to me – do yourself and the environment a favour and eliminate the need for ALL OF THE ABOVE; continual mowing, weeding, feeding and mulching. HOW: by making your orchard, less work to maintain, more productive AND more beautiful. COVER CROPS provide a living carpet of perennial plants for orchards. A ‘living mulch’ of low growing legumes, grasses and other wildflowers can provide many advantages, especially compared to exotic lawn grass (kikuyu,couch and buffalo) which aggressively competes with your fruit trees for water and nutrients – and you have to mow it! The best way to start is with a LEGUMINOUS COVER CROP. Legumes are plants such as lucerne, pea and bean family, medics and chickpeas. WHY IS THIS A GOOD IDEA FOR ALL ORCHARDS? : How about feeding the soil with the plants that are growing there? Legumes have the ability to fix nitrogen from the air onto their roots which then becomes available, via the soil, to other plants. Nitrogen is a major element needed for plant growth. Protects valuable topsoil from rain and wind erosion. Suppresses weeds without the use of herbicides. Improves the health of your soil by increasing organic matter, earthworms and vital microorganisms. Reduces compaction of the soil by frequent mowing. Prevents hardpans and soil cracking and brings up minerals from deep within the soil. Improves water, root and air penetration of the soil. Provides nectar and pollen for beneficial insects and reduces populations of pests by providing a more balanced, diverse and natural habitat. Looks wonderful – if you would rather have the buzz of insects than the sound of a mower, and the flit of butterflies and birds on the wing – then this is for you. Is ultimately less work and saves you money – have you seen the price of a bale of lucerne lately? 1. It’s obviously much easier to do this when establishing a new orchard as you need bare earth to sow the seed in. 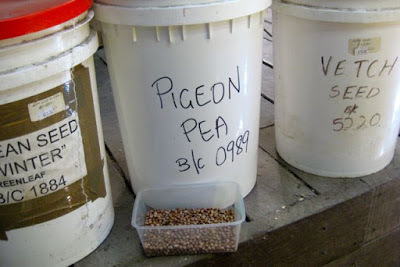 Seeds are available from any rural seed supplier. Hire a steam weeder to kill the grass – being used more and more by Councils and road side authorities as alternative to harmful herbicides. For smaller areas – sheet mulch with cardboard and straw. 3. Now for an important little bit of science. 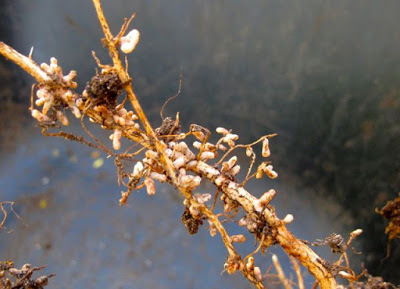 The fixing of nitrogen by legumes from soil air require the presence of species specific bacteria (rhizobia) so it’s important to buy seeds that have already been inoculated with the relevant rhizobia as your soil will probably be deficient in these important bacteria. 4. Make sure you have summer (e.g. cowpeas, lab lab, soybeans, desmodium, siratro) and winter ( e.g.lupins, vetch, oats, ryegrass) growing crops as you want year round cover. 5. Add a grass seed to your cover crop – including native grasses and others like oats, barley and ryegrass – has many benefits including; increasing organic matter and carbon input, encourages smaller seed eating birds and more beneficial insects. 6. 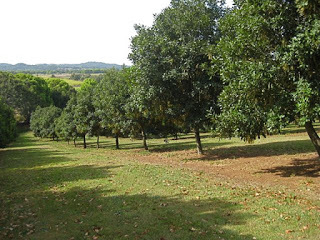 Orchards with a lot of shade (macadamias, mangoes and avocados). The DPI (Department of Primary Industry) recommends the native Smothergrass Dactyloctenium austral and Amarillo peanut Araelus pinto. 1. Once your new meadow is established slash as required!!!! This may only be a couple of times a year!!!!! Important to do it once in the late summer to encourage re-seeding. Leave anything you have slashed to rot down. 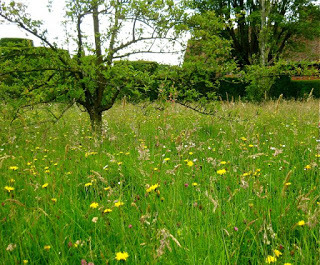 Re-seed any bare patches – then just sit back and ENJOY IT. Go to this link by the NSW DPI for lots of useful information. Guess what Prince Charles gave his mother to celebrate the 60th anniversary of her coronation (no, it wasn’t a corgi) – a MEADOW in every county rescued from abandoned waste ground.